The tragic loss of precious, ancient or old copies of writings form India's religious heritage continues into the twenty-first century. When we undertook this microfilm project in the early 1980s, our specific task in the field was to film rare books and manuscripts of the Ramanuja, Madhva, Nimbarka, Vallabha, and Gaudiya traditions, as well as texts of other Sampradays and individual authors. Our purpose was to try to preserve at least a representative group of such writings, otherwise bound to destruction through lack of proper conservation. A small team o photographers and researchers spent a total of eighteen months in India, locating, identifying and photographing numerous hand-printed, paper and palm-leaf manuscripts as well as some printed editions from the Vaisnava traditions. It is on the basis of this collection, that we have selectively developed the present Vaisnava Literature Catalogue: Microfilms in the Adyar Library, the Bodleian Library and the American University Library. Charles S.J. White (Ph.D. University of Chicago) is professor emeritus of philosophy emeritus of philosophy and religion at the American University in Washington, D.C., USA. He was visiting professor and fellow in the Oxford Center for Hindu Studies at Oxford University, U.K. He is the author of The Caurasi Pad of Sri Hit Harivamsa, Ramakrishna's Americans, and co-author of The Religious Quest and Joseph Campbell: Transformations of Myth through Time. The Materials presented here form a part of the original Vaisnava Literature Conservation Project, funded by a grant from the Smithsonian Institution and the Institute for Vaisnava Studies. Dr. Graham M. Schweig, Ph.D., Director, Indic Studies Program; Associate Professor of Religious Studies; Senior Editor, Journal of Vaishnava Studies, Department of Philosophy and Religious Studies, Christopher Newport University, Virginia, while still a graduate student, together with colleagues, originated the proposal to the Smithsonian Institution that began this endeavor. Mr. Gregory Jay (Gaurakeshava) was the Operations Manager in India. Francine Berkowitz directed the South Asia grants of the Smithsonian Institution. The total extent of the present Catalogue includes 1679 entries. 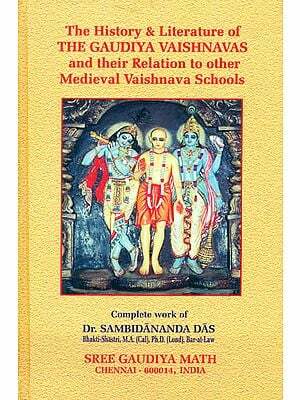 The organization of the files and the preparation of the first entries in the Catalogue received support from the American Institute of Indian Studies and the Institute for Vaisnava Studies. We wish to express special thanks to the Director General of the American Institute of Indian Studies, Dr. Pradeep Mehendiratta, for supplementary financing. Our deep appreciation goes to Mrs. Radha Burnier, International President of the Theosophical Society, and to Mrs. Parvati Gopalaratnam, the Librarian of the Adyar Library, for allowing us to deposit a complete set of the microfilms in the Adyar Library and to carry out the organization of the files (numbering twenty-five volumes, and the immediate source of the Catalogue), the printing from the microfilm reader printer and preliminary work connected with the preparation of the Catalogue. Thanks are also due to the Honorary Director of the Adyar Library, Dr. K.K. Raja for his support of this work. Dr. William Deadweiler and Mr. Robert Cohen made special contributions to creating the Catalogue project. Mr. R. Laxman and Ms. K. Jayasree, and other members of the Adyar Library staff, were of great assistance in the preparation of the Catalogue files. We thank Dr. V.K. Chari for his help in Telugu consultation. Mr. S. Venkatesh, incharge of the computer section of the Adyar Library, and Mr. Christopher Raj gave indispensable aid in the printing of the Catalogue draughts. Our deepest thanks go to Srimati Savitridasi, who created the diacritical marks for the typing of the Catalogue and also provided the alphabetized index. Thanks to Gopiparanadhana Dasa for his assistance in formatting the diacritical text. We appreciate, too, the cooperation of The American University Librarian Ms. Patricia A. Wand and The Archivist Mr. George D. Arnold, assisted by Mr. Ignacio Moreno and Mr. Christopher Lewis of Media Services. Thanks go also to Dr. Gllian Evison and Ms. Lesley Forbes, of the Bodleian Library of Oxford University for their assistance in making the microfilms available in the United Kingdom. I also express my thanks to Mr. Shaunaka Rishi Das of the Oxford Center for Vaisnava and Hindu Studies for his cooperation and to Dr. Allen W. Thrasher, Senior Reference Librarian of the southern Asian Section of the Library of Congress, who kindly agreed to review the Catalogue. The work rendered by Dr. S. Jayasree in annotating and Mr. S.A. Lokesh in transcribing data on the microfilms in this Catalogue was of utmost importance. The microfilm titles, listed in the Catalogue are available for consultation in the Libraries as mentioned in the front of the book.